Ok, products ... euh nothing to sell here! 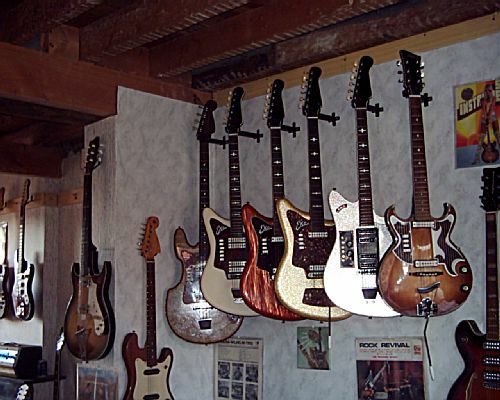 Only looking for information about my electric guitars and amplifiers. As You can see: I collect almost everything about electric guitars, even the (well known) Smurfs! A view on the East-European and German side of my museum. Down right you can see two Defil's, made in Poland: a Julia II in a violin shape and a 12-string Echo II. 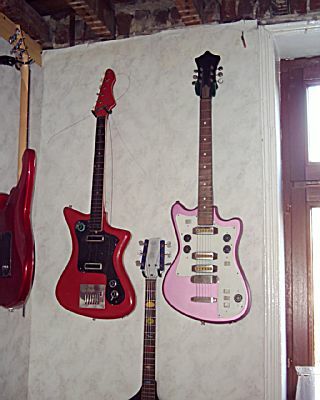 Besides the Defil's are a few Jolana's, made in Chzechoslovakia: two Iris and a Star V.
Hanging on the wall are three Höfner's, besides them two Klira's and four Framus's. Another part of the museum: the Italian side, with the Eko's: glitter & shine from the 60's! Together with the guitars are also a few Eko amplifiers. Those aren't easy to find! Everywhere you look you can also find LP's and singles with guitars on them. 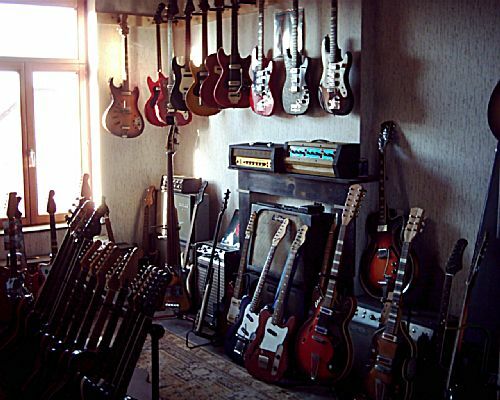 I've a few hundred and some of them with guitars or basses found in the museum. Well here's one of my Eko amp's: Electric and Acoustic Guitar Amplifier, manufactured by Eko Strumenti Musicali S.P.A. Recanati, Italy. It's build in 1972 and I've a strong feeling that also Charlie amp's used the same amplifiers. I've been told that Jan Akkerman used such amp's in the 70's. This Eko "2230/SC800" Solid State has two channels with incorporated reverb. Although I'm into (full)valve amp's I must say that this design, as many from Italia, is very nice and eye strucking. But, as for lots of items, I couldn't find any thing on the Net regarding this amplifier. Besides the SC800 there's another Eko amp: Herald I, build in the 60's. Here's a small part of the Japanese section. 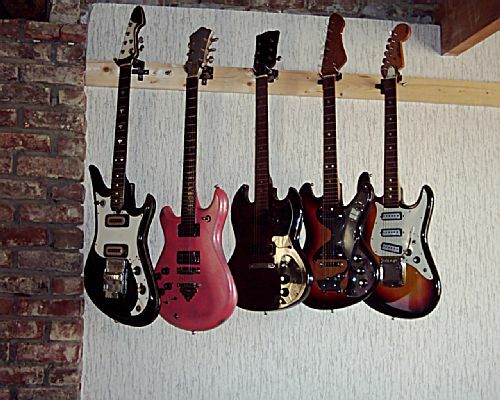 Left there's a Teisco (model unknown), then an Ibanez Musician Lefty, then a Samick-Hondo SG under the brandname Life(especialy for MusikJacobs Euskirchen Germany), an unknown who also can be seen at the welcome page and an Aria Strat-like. Aha! Even Russia has his guitars. Here's (right) a mid 80's Solo "dwa" (russian for two) with an incorporated fuzz and phazer device. There for all those knobs and switches. Although this guitar has the looks of being very sofisticated and special, she doesn't play well. With a very thick arm and a lot of weight this guitar isn't very playable. But it's a guitar and probably some one overthere has enjoyed it! Soon I will get another Russian guitar: a Formanta. Those guitars aren't easy to be found in our western world. The red one besides the Solo II ... still researching its origin, but now I'm certain it's a Bulgaria "Orfeus" cheapy from the 70's!, and not realy easy to be used. Whenever you need to change a cord it's possible that the tremolo rips the others apart and pushes the tremolo cover off of the guitar. Better tie the tremolo arm to the guitar before changing cords! This guitar is a real beauty, very easy to play and eye catching! This is one of the heavy amp's. At first sight and from a distance it seems an Orange ... but no: it's a Ranger. I took this amp completely apart, first to repair it, but the real reason was to find out by means of the transformers and/or the potmeters or valves (full valve amp! ), or ... to find out where or who build this heavy amp. No luck ... nothing to be found in this one ... All I know is that's a Ranger "Two Bass" with 2x 12AX7; 1x 12AU7 and 4x EL503!! Must be a 100W power beast. So: if anyone knows something about this Ranger brand (Orange kloon ...) please let me know, I really will appreciate it !!!! Today (31-aug-04) received info from FBT, an Italian amp manufacturer, that Ranger was produced in the 70's by them. There was an 150 and a 250W bass amp with one or two boxes!